Miles Teller stars in “Bleed for This.” Photo Credit: Open Road Films. Boxing is nicknamed the “sweet science,” which is a strange name given that it is arguably the most violent and physically punishing sport. Anyone who steps into the ring needs to be fearless and be incredibly tough to withstand the toll one takes from receiving repeated shots to the head. Now, imagine the toughness you would need to step into the ring and take punches to the head after recently breaking your neck in a car accident. In writer and director Ben Younger’s latest drama, Bleed for This, boxer Vinny Pazienza’s real life story comes to the big screen. The film covers his quick rise to boxing glory, the tragic accident that nearly cost him everything and his astonishing path to recovery. The film opens with Vinny “Paz” Pazienza, played by Miles Teller (War Dogs, 2016), his family and his trainer helping him recover after losing a fight with the champion Roger Mayweather (Floyd Mayweather Jr.’s uncle). Paz and his trainer, Kevin Rooney (Aaron Eckhart, London Has Fallen, 2016) think he should fight at a more natural weight class given his struggles to cut weight and in the ring. Paz’s father (Ciarán Hinds, Frozen, 2013) who manages the gym, is worried that Vinny is not ready for the change, but eventually agrees with Rooney’s plans and is able to arrange a title fight for his unrelenting son in his first match as a junior middleweight against Frenchman Gilbert Dele. Despite very low odds to win the title bout, Paz is able to rally from a rough start to dominate the fight and become the world champion. Although the surgery goes well, the road to recovery is just beginning for Paz as he still dreams to fight again. The persistent Paz wakes up in the early morning hours when everyone is still asleep to train back to his old self. Rooney, his trainer, who is incredibly reluctant to disobey doctor’s orders, eventually realizes that fighting is all Paz has and secretly helps rebuild him under his parent’s roof while trying to convince both himself and the world that Paz’s career isn’t over. Bleed for This is surely an incredible comeback story and proves what the human spirit can overcome. Miles Teller, who had a number of films in 2016, fully embodies Paz as the lead actor including bulking up for the role, taking boxing lessons, and mastering the accent. Teller even has the look of a boxer with scars from his childhood which help him embody the gritty, Italian boxer from Providence. Eckhart also does a fine job as Paz’s loyal trainer, who helps bring the fighter back from his darkest moments. Eckhart, who is more known for playing a handsome leading man, is almost unrecognizable as he sports the paunch and balding head of Rooney who would later train Mike Tyson to superstardom. Although the boxing scenes are shot well and convey the punishment boxers endure, the fight scenes run a little long. Also, while the father-son relationship between Paz and his father can be touching at times, particularly towards the end of the film, it doesn’t click in the outset of the film, especially compared to the chemistry between Teller and Eckhart (who worked together in the 2010 film Rabbit Hole). Even still, the movie packs a punch and isn’t worth a count out from your watch list. 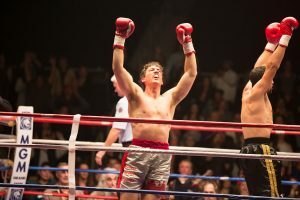 Bottom Line: While audiences may feel overexposed to the abundance of boxing movies in the last few years, the comeback story of Vinny Pazienza in Bleed for This is worthy of a viewing, especially for Miles Teller’s remarkable performance.